Heather MacKenzie is an artist who has an emotional link with her subjects. Her art has evolved over the years from representational to impressionism, where she uses watercolor pointillism to evoke ethereal images that dance with color. Heather started painting at an early age in oil, with no formal training. Her grandmother opposed the smell associated with oils, so she took up watercolor in her teens, although she enjoys many mediums. She grew up in Chatham, Cape Cod, and went to Massachusetts College of Art on scholarship. Her philosophy is; “Life is a canvas, make everything art and make art out of everything.” At MassArt, she never took a painting class, although she was accepted to the fine arts division. Instead, she was drawn to photography and filmmaking. After graduating with a B.F.A. in cinematography, she moved to Los Angeles and worked in film, which landed her a position with the American Broadcasting Company. She became a camerawoman for the news and embarked on a fabulous career, traveling the world while documenting historical events. These are a few of the events she covered; the first Holocaust Reunion in Israel in 1980, President Reagan’s cross-country re-election campaign, the release of hostages from Iran, the Summer and Winter Olympics of ’84 and ’88, twenty five years of Academy Awards, the Oakland and Northridge earthquakes, Super Bowls, NFL and college games, both Dodger’s World Series, Romania’s orphans, O. J. Simpson’s criminal and civil trials, Princess Diana’s funeral and Michael Jackson’s court battles. While working and traveling under a demanding schedule for ABC7, she also earned a Masters of Fine Arts degree, pulling a fulltime load of graduate courses in television and film, at the University of California, Los Angeles. Heather always found the time to paint and create with her photography. She launched many successful shows, from Hollywood to Chatham. Ms. MacKenzie survived a serious threat to her health and decided to accept a buyout from Disney/ABC, Inc. in the summer of 2009. 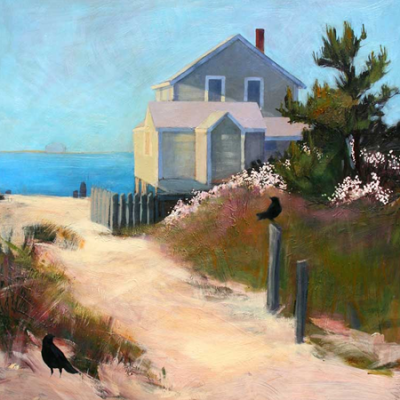 She moved with her husband to Cape Cod with the desire to concentrate on following her dreams of making a living as an artist. Heather is inspired by the Cape’s environment and wildlife. Heather has won muliple prizes for her photography and art, conducts workshops at the Chatham Bars Inn and is working on writing a book about her life as an award-winning electronic-news-gathering camerawoman. She enjoys gardening, cooking, kayaking and water sports. She designed her home’s interior and has always transformed her environment as an expression of her artistic talents. Heather loves impressionism, especially Monet, Cassatt, Manet and van Gogh. She finds inspiration in beauty and hopes her expressions give joy to those who own her paintings. 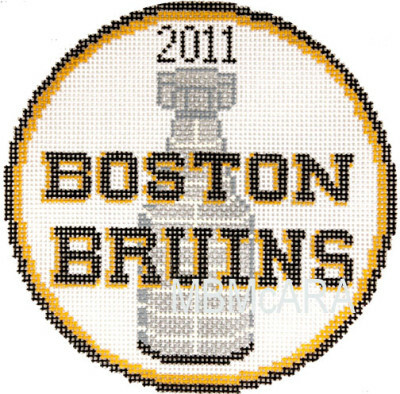 Needlepoint has come a long way since I first learned to paint canvases some 30 years ago in Camden, ME. Today, stitchers have a huge variety of fibers, stitches, and colors from which to choose. Canvases can be assembled into stuffed frogs, picture frames, slippers, purses, belts, Christmas Stockings and so much more. Theme-wise, my designs reflect my New England background and an affinity for anything nautical. My specialty is creating custom designs for stitchers. These can include portraits of houses, pets, code flag belts, monogram pillows, etc. What can I paint for you? I moved to Cape Cod in 1978 (for 2 years) from the beautiful town of Amherst, MA and have pretty much lived on “The Cape” ever since. I have been involved with photography for as long as I can remember… way, way, way before “digital”. If my memory serves me correctly, my first camera was a Kodak Duaflex IV. I have always been the one taking pictures and “coaxing” friends and family to sit through slide shows. Back in the late 70’s while attending Cape Cod Community College I was involved with managing the photography & darkroom club (where I spent hours upon hours). I also served as the Photography Editor for the school’s literary magazine, “Sea Change”. My lovely wife Jill and I spent the “winter season” of 92/93 in NH where Jill taught at her alma mater, Plymouth State College for a professor on sabbatical and I worked for Sharpshooter Photography at Waterville Valley, NH, shooting ski races and on the mountain photographs of Waterville Valley guest enjoying their day of skiing. Don’t tell Jill, but I think I might have gotten the better end of the deal! So, at the urging of family & friends over the years (of whom I am most grateful for their support and nudging) here I am!! 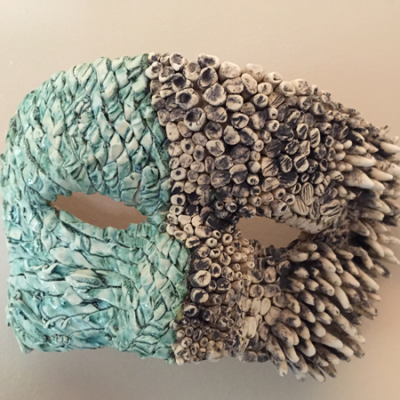 I am primarily a ceramic artist—in sculpture and hand building—experimentation, play and learning new methods and techniques inspires me. My work often reflects the doodles I sketch whenever I have pen and paper handy— but I also enjoy photography— details—texture—the play of light and dark—juxtapositions of objects in the landscape. I am a clay artist–primarily sculpture and hand-building. I make masks, jewelry, singing stones and other objects. I also enjoy writing and photography. Experimentation, play and learning new methods and techniques inspires me. Â I have led classes for youth and adults in mask making and exploring creativity. I studied ceramics at the Radcliff Clay Studio in Cambridge and RDG Dahlquist Art Studio in Des Moines, IA. Painting / Drawing: I’m primarily an oil painter but I use other mediums as well. My work is representational/impressionistic. I like to paint landscapes, portraits and still life in oils, pastels, or watercolor. Children are a common theme in my paintings. 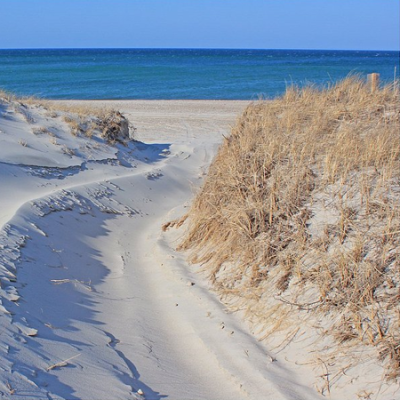 I am a freelance photographer specializing in landscape and nature from Cape Cod and around the world. I have photographed the Cape for over twelve years and have traveled and photographed in more than 35 countries on five continents. Alyssa D. Metcalfe was born in the Inwood section of New York City in the early 1960s. She and her older sister were raised by their British jazz pianist father and American mother who worked as a secretary, but never missed an opportunity to march against injustice. 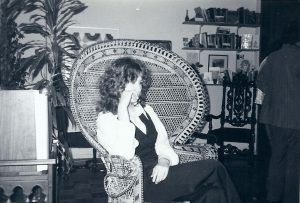 By the early 1970s, her family qualified for affordable artist housing in the West Village, where a lot of adults shared a hands-off style of parenting. There was little supervision and less discipline. As a result, Alyssa and her new friends used the city as their playground, theater, and teacher. It is through those experiences that many of her stories have been inspired. As an adult, Alyssa attained an A.S. in Equine Studies from Northwest College in Powell, WY and a B.S. in Animal Science from UMASS Amherst. 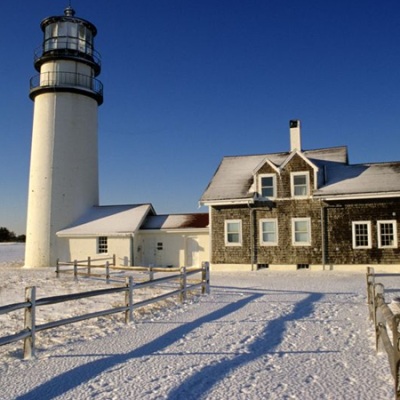 She currently lives on Cape Cod, where she sits on the board of directors for the Cape Cod Writers Center. 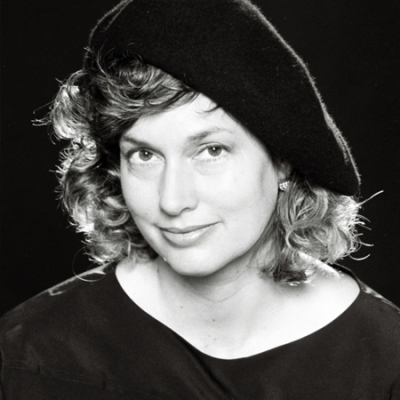 In July, she won first place in Gemini Magazine’s short story contest with a piece entitled Epiphany on the E Train. I create stained glass and weaving pieces inspired by the Cape and all its elements. 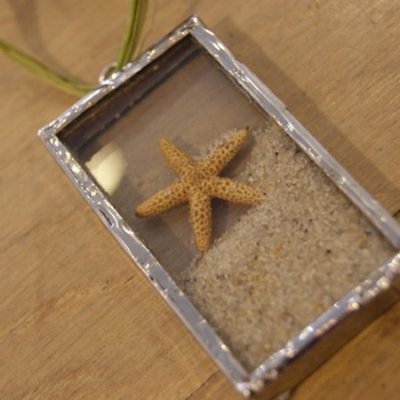 In my artwork I use pressed flowers, Cape Cod sand, shells, grasses, and other found objects to make each piece unique and true to Cape Cod. My specialty is Custom Wedding Invitation Boxes, wedding favors and gifts. Please feel free to contact me with any questions or interests. Hope you enjoy my work as much as I do! 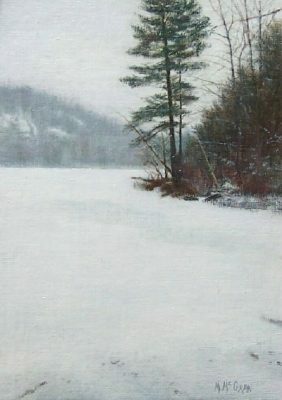 Born in Brockton, Massachusetts, I received a Bachelor of Fine Arts degree from the Massachusetts College of Art and a Master of Fine Arts degree from Syracuse University. 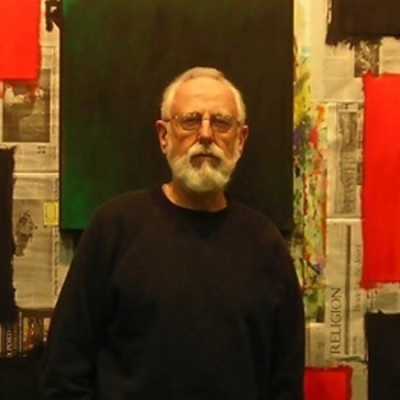 After serving as a medical corpsman in Vietnam I taught painting and design at the State University of New York. I’ve been a director of the Louis K. Meisel Gallery in New York and have worked on numerous gallery and museum exhibitions as well as projects for television. I have exhibited with the Louis K. Meisel Gallery, Pictogram Gallery and Marcia Udo Gallery in New York, the Morgan Gallery in Kansas City, and in more then 40 group exhibitions in the United States, Europe and Puerto Rico. Represented by the Louis K. Meisel Gallery, New York. Kim Moberg was born in Juneau, Alaska, the daughter of a classical pianist mother of Alaskan Native Tlingit descent and a US Coast Guard veteran father from Kansas. Music was the constant in Kim’s childhood, helping her to adjust to the frequent moves associated with growing up in a military family. At the age of 14, Kim began playing acoustic guitar on a borrowed nylon 6 string. A few years later, Kim taught herself to strum and finger pick to her favorite songs by singer/songwriters of the 1970’s, but debilitating stage fright kept her from pursuing her own dream of becoming a professional performer. In 2014, after a hiatus from music to raise her two daughters with her husband, Kim set out to overcome her stage fright and wrote her first song. Kim’s debut CD entitled “Above Ground”, celebrates the achievement of her goal to bring her music out of the basement. “Above Ground” charted at #23 on the 2018 Folk Alliance International Folk DJ Charts. 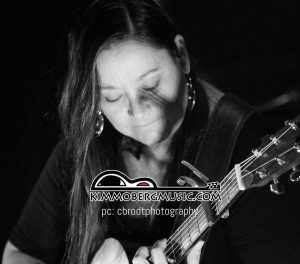 You will find Kim performing at Coffee Houses, Festivals, House Concerts, Events and Performing Arts venues throughout the New England region. Award winning Sailor’s Valentine artist. Teach classes, private commissions, and gallery exhibits. Tessa Morgan was born and raised in Washington DC and taught to throw as teenager. She had been drawing all her life, so it was second nature to carve designs into colored slip on her earliest pots. 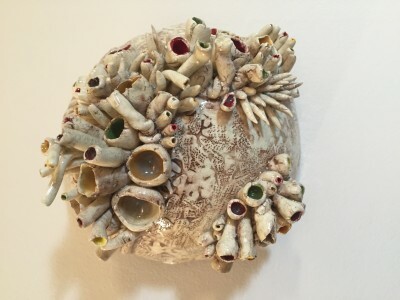 She majored in ceramics at Connecticut College and in 1983 set up a small studio in Woods Hole. 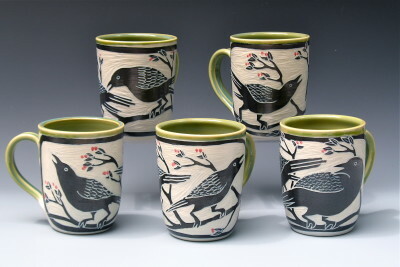 In 1993 she received a BFA in illustration from Massachusetts College of Art and has since enjoyed a dual career as potter and illustrator. Her children’s books include Do Whales Ever…? and Do sharks Ever…?. and she has collaborated on various projects with scientists in Woods Hole. 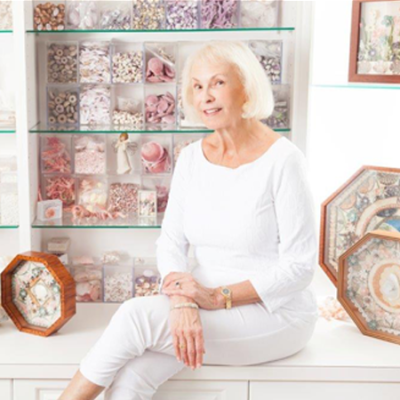 She opened the Flying Pig Pottery in 1999 and has been in many shows on the Cape. Her projects include a large tile installation at the Falmouth Public Library. 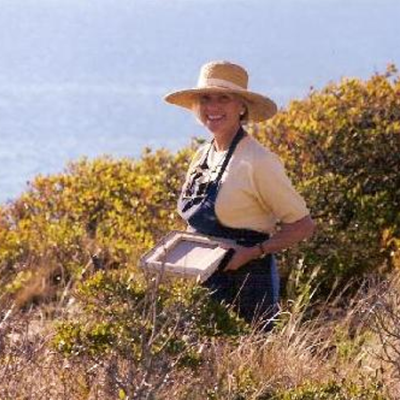 She is a member of the Society of Cape Cod Craftsmen and Cape Cod Potters. 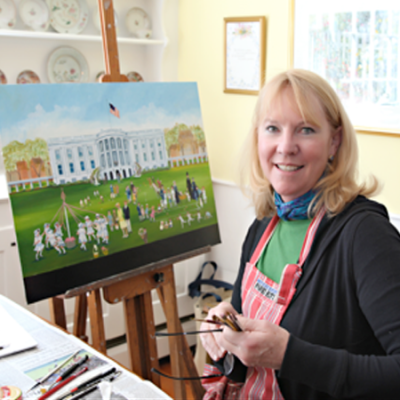 She has been a featured artist in Cape Cod Life Arts magazine as well as Cape Cod Life and other publications. As a fiber artist, fabric and thread are my paints and paintbrushes. I use my sewing machine and a technique called thread painting to create sea grasses, fences, and much more. 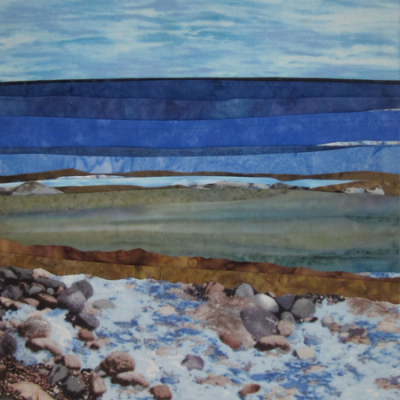 I make framed seascapes and landscapes, art quilts and fabric art stretched on canvas. I am a working artist, painting in oils. I publish prints and note cards. I also give lectures on various topics, and teach art history. I am available to speak at organizations, and to give private classes in art history to clubs and private at-home groups.